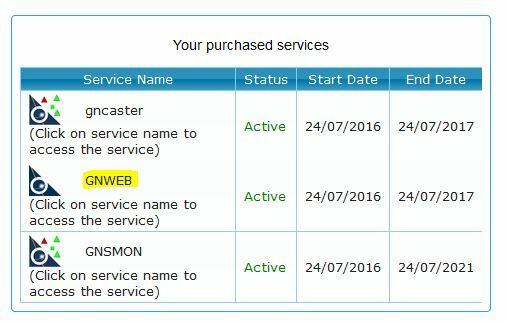 If you have purchased the GNWEB service, the said service will be activated automatically for you and access will be granted (see highlighted service in above image). All further user authentications (if required) to any service within SLCORSnet will be with the same username and password credentials. On the top left corner, you are able to select the file generation method from RINEX or Virtual RINEX. Alternatively you may click on ‘select’ button at the bottom and place the red circle (with a red dot in the middle) that appears on the map anywhere within the network. Also, you may type in the required coordinate in the space provided at the bottom and the circle will be automatically placed on the map. Once placed, it is possible to increase or decrease the size of this circle as shown below. When you change the size of the circle, you change the physical reference stations (quantity) from which the RINEX file will be created. If the circle is larger, it will increase the number of physical reference stations from which the system will use raw data to generate the RINEX file. The radius of the circle can also be input in KMs at the bottom of this page. Alternatively, you may also use the Virtual RINEX mode to create a RINEX file for any point with in the network. Virtual RINEX files are generated from the SSR database within the network. Once virtual RINEX mode is selected from the top left corner, you may click the ‘select’ button as before or type in the required coordinate in space provided at the bottom. Also enter the required ellipsoidal height of the virtual RINEX point at the bottom of this page next to the coordinates. A red triangle with a red dot in the middle will appear as shown below.